Always look at the sunny side of life, while keeping it out of your eyes. This visor features embroidered artwork on the front and an adjustable closure in back. Perfect for the beach or the backyard. Easy, breezy nylon. This cap fits like a favourite, keeping you cool and covered wherever you explore. This ones for the kids. Our Chill Cap features embroidered artwork and an adjustable back closure. This one’s for the kids. Our Chill Cap features embroidered artwork and an adjustable back closure. 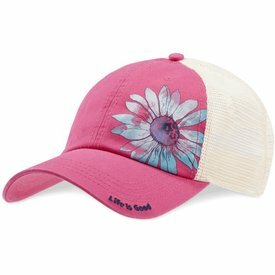 Life is good with this Soft Mesh Back Chill Cap! It’s fabric and garment washed, featuring artwork up front and a snap back. This ones' for the kids. Our Chill Cap features embroidered artwork and an adjustable back closure.